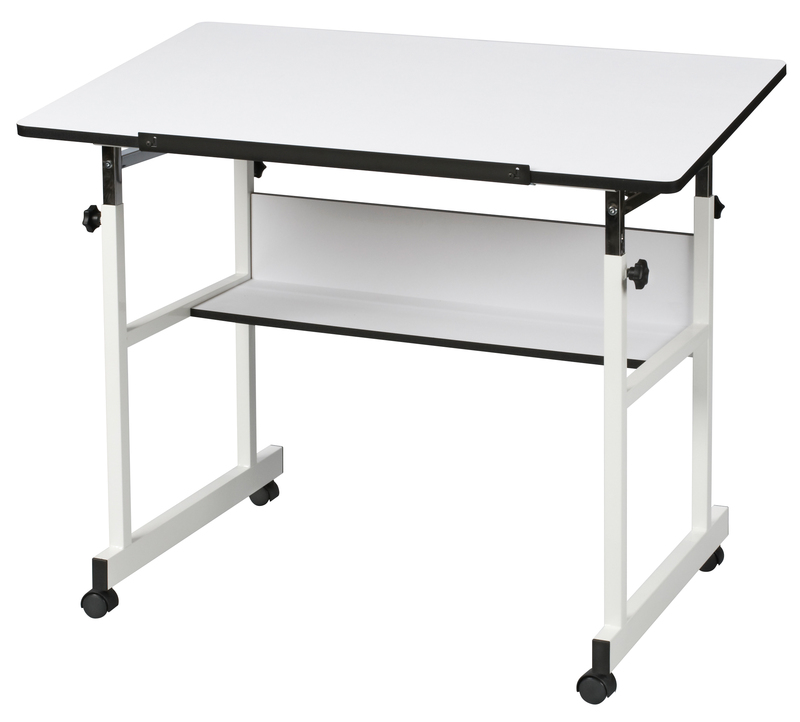 Tough steel frame for hardwearing classroom use. The 1 1/4" x 1 1/4" tubular steel frame is finished in black. 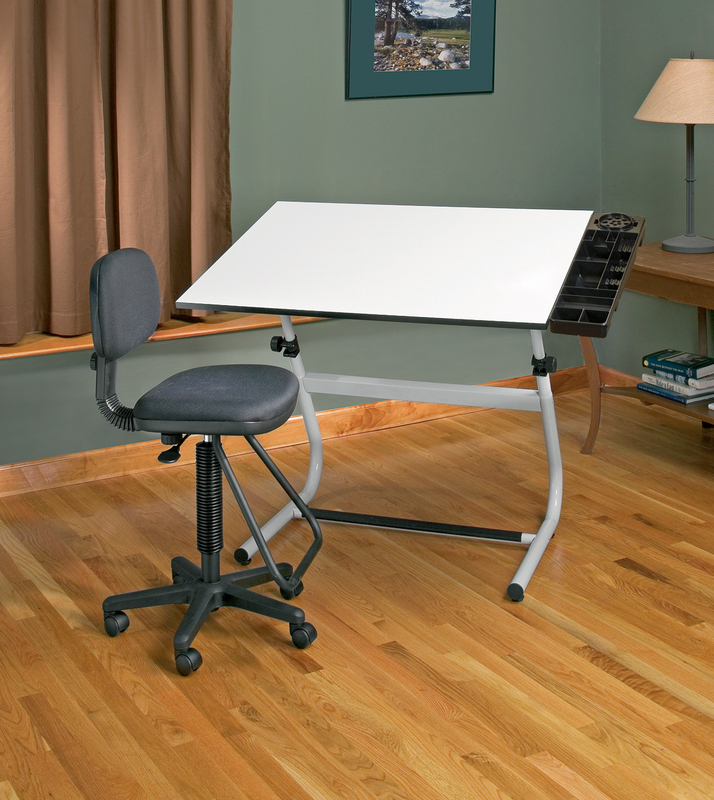 The adjustable height range is from 32" Desk Height, to 42" when horizontal. Board angle adjustment from horizontal to 55 degrees. The overall table base is 24" wide x 30" long. 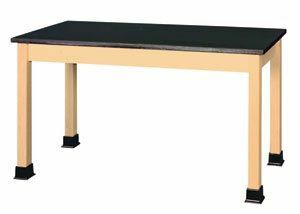 Fitted with steel centered underboard instrument tray 30" long x 9" wide, and rubber coated steel double footrests. Sturdy handwheels, and elevating angle slides. 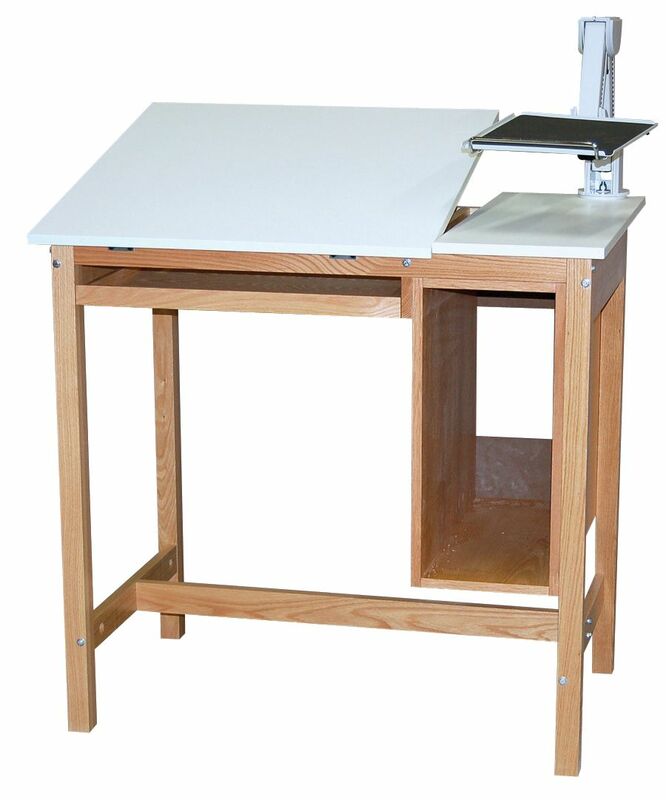 Designed for easy height and angle board adjustment, utilizing the double hand-lever system. Horizontal height adjustment from 31" to 44 in. Angle adjustment from 0 to 90 degrees. Frame footprint is 24" deep x 33" wide. adjusted with one easy-to-use extendable lever, which also controls the working board angle. Angle adjustments from horizontal to 90 degrees, adjustable height from 35" to 47". Height and inclination regulated and balanced with traction springs. Features a double-pedestal base of heavy gauge steel with rounded profile for superior stability. Tools supplied for easy assembly. 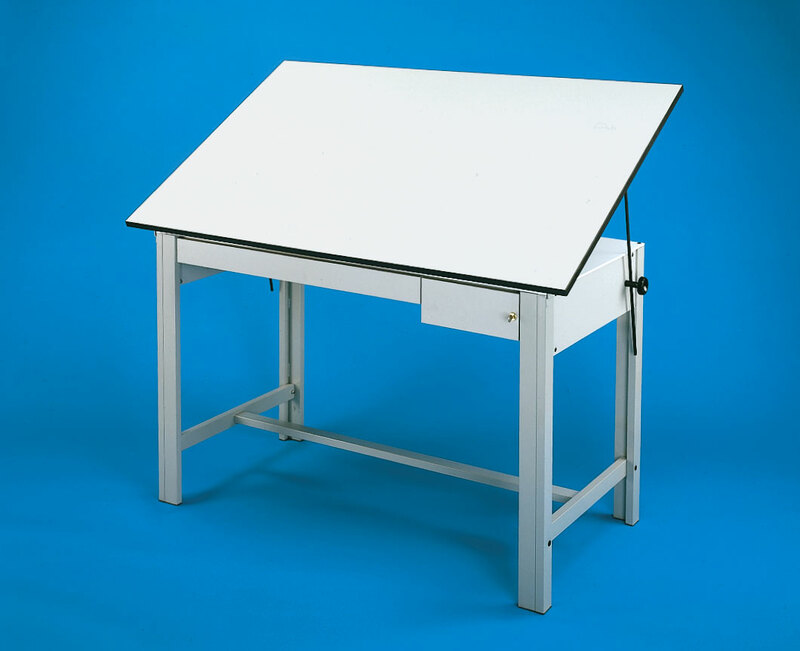 Warp-free white Melamine drawing board. Choice of black or Eggshell frame. 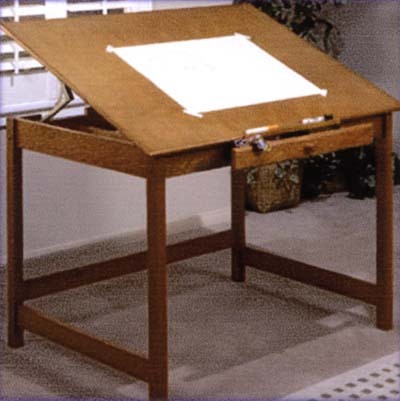 DOUBLE PEDESTAL DRAFTING TABLE Rigid balanced metal frame for the professional who demands a lot from a drafting table. 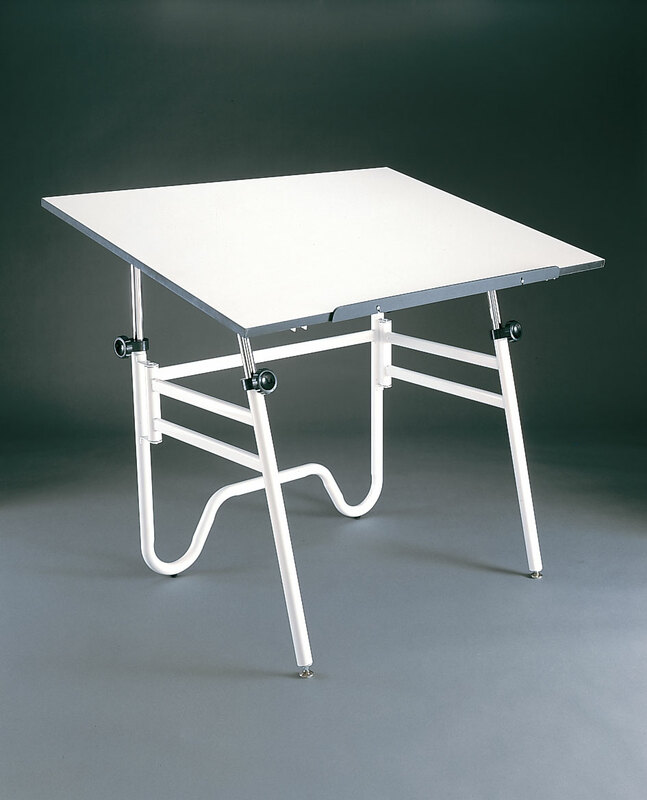 The white Melamine board is balanced by adjustable compensating springs. The Board angle and height adjustments are simultaneous, and easily controlled by a locking foot pedal. Board angle adjusts from horizontal to 85 degrees. Height adjusts from 34" to 42" in the horizontal position. Tools supplied for easy assembly. Choice of black or ivory frame. 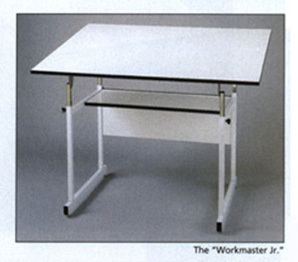 Italian Premium Designer Table for the discriminating Professional. Both vertical and tilt movement are controlled by a single foot pedal. Minimal floor area required. Robustly constructed for maximum rigidity. Durable melamine faced board. Standard Color: Black. 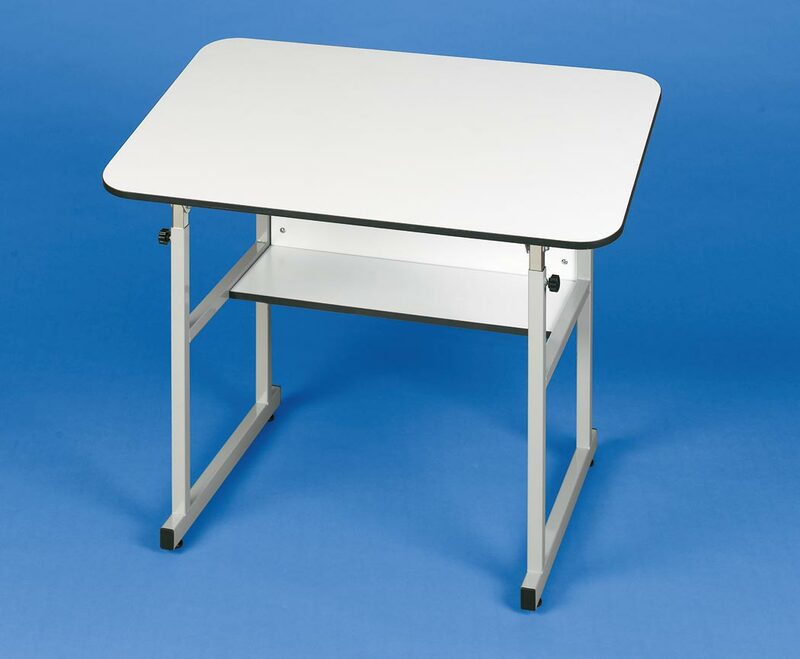 The Ranger is a professional extremely durable and stable all metal table 37" high, and features a work surface that tilts from the horizontal to 50 degrees. The top is woodgrain Melamine with steel end cleats and front rub rail. Standard finish Desert Sage. Also available in Black or Gray. Tool Drawer comes with insert tray and lock. Shallow Plan Drawer provides storage for papers and reference materials. Shipped knocked down. Table with Tool Drawer only. Select hardwood frame with thermally fused birch melamine top with steel end cleats. Standard finishes are - Naturalist, Golden Oak, Unfinished. Shipped knocked down. 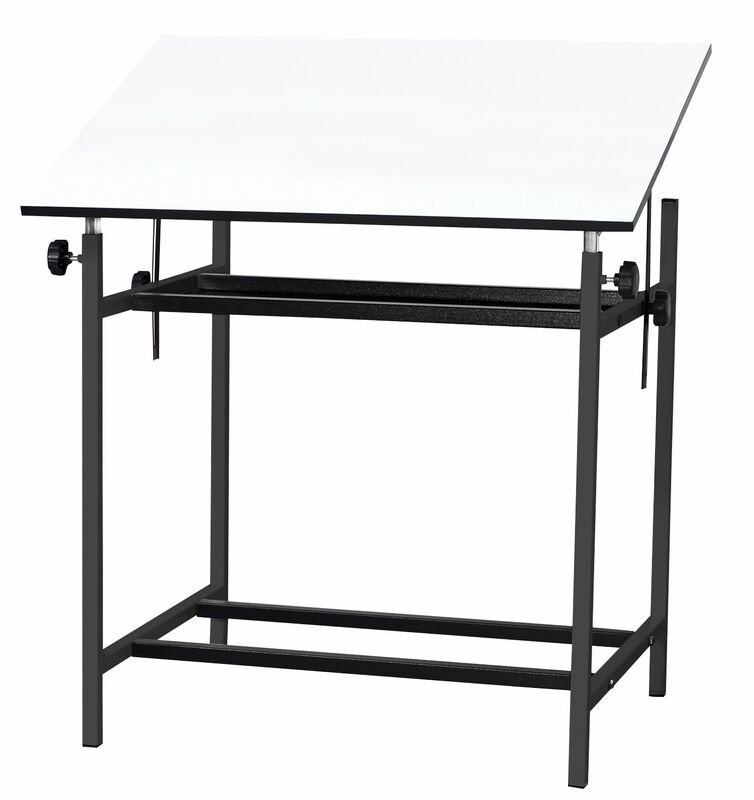 The durable utility design of the Precision Drafting Table keeps your workspace productive. 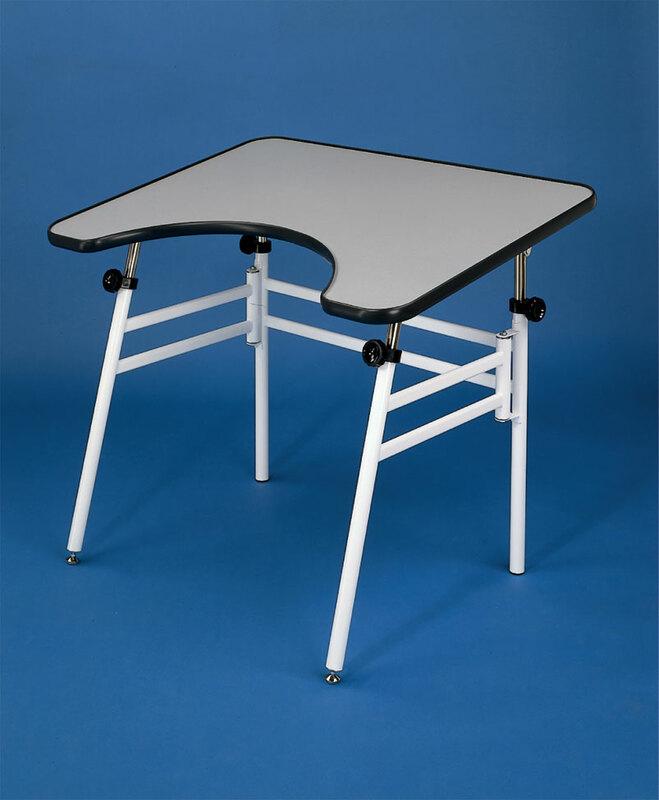 Traditionally styled, the SAFCO PRECISION table features a sturdy steel base with a 4-post design and stabilizing bars. Includes 12 1/2" x 29 2/4" tool drawer with lock, and 38 1/4" x 28 3/4" reference drawer. Sturdy 1" boards have non-glare, green laminate finish with smooth edges. Angle of board is easily adjustable up to 50 degrees without tools. 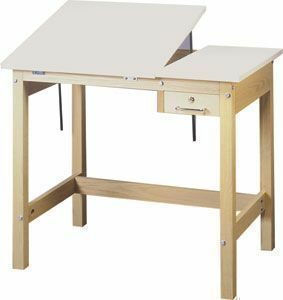 4-POST WOOD DRAWING TABLE Attractive, functional and very durable, this 4-post drafting table is constructed of the finest quality solid oak. 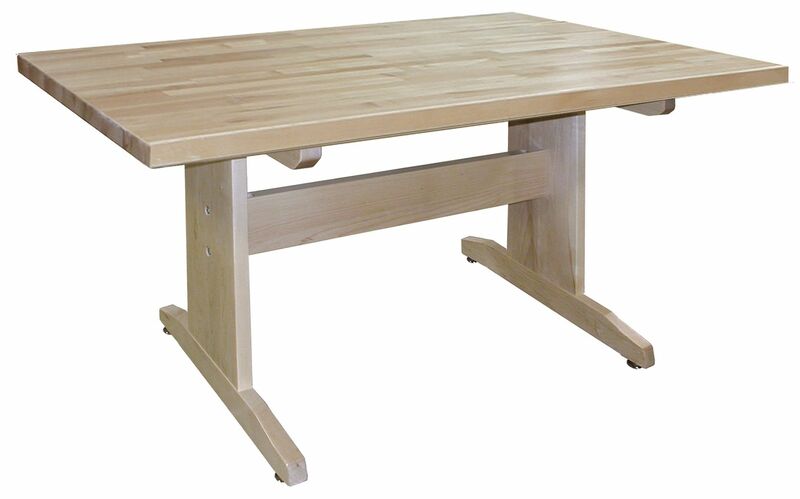 Careful selection of materials and thru-bolt construction ensure that this table will stand up to years of rough use. The solid oak base is finished with two coats of clear varnish for extra protection. available in three sizes, and two heights. Tilt mechanism enables the user to quickly adjust the top angle from 0 to 45 degrees. 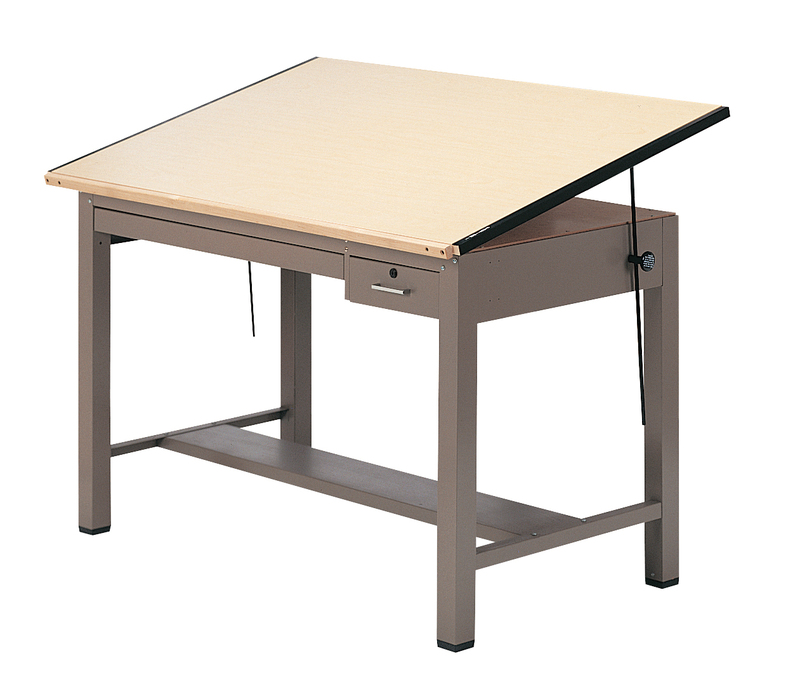 The 37" height table includes a 23" deep x 31" wide x 1 1/2" high drawer with dust cover. Easy assembly using the included instructions. 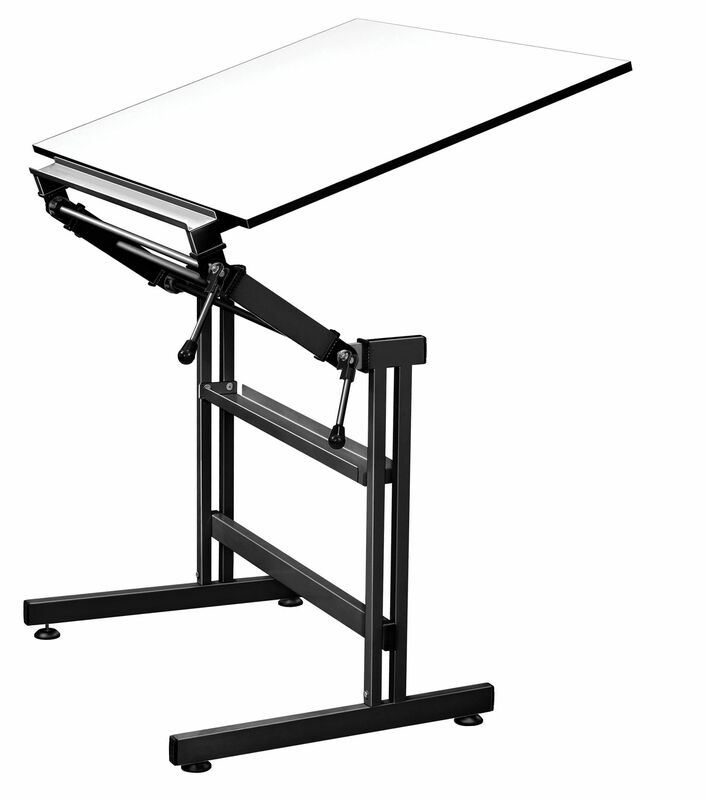 Split-top model is ideal for drawing on one side, and a convenient flat reference or Laptop surface on the other. and 37 1/2" x 18" flat section side shelf. A table of superior strength and durability. Manufactured from 18 ga. steel tubing. The legs are welded together to form a 3" x 2" post for maximum strength. Powder-Coated durable finish in choice of Gray or Black. 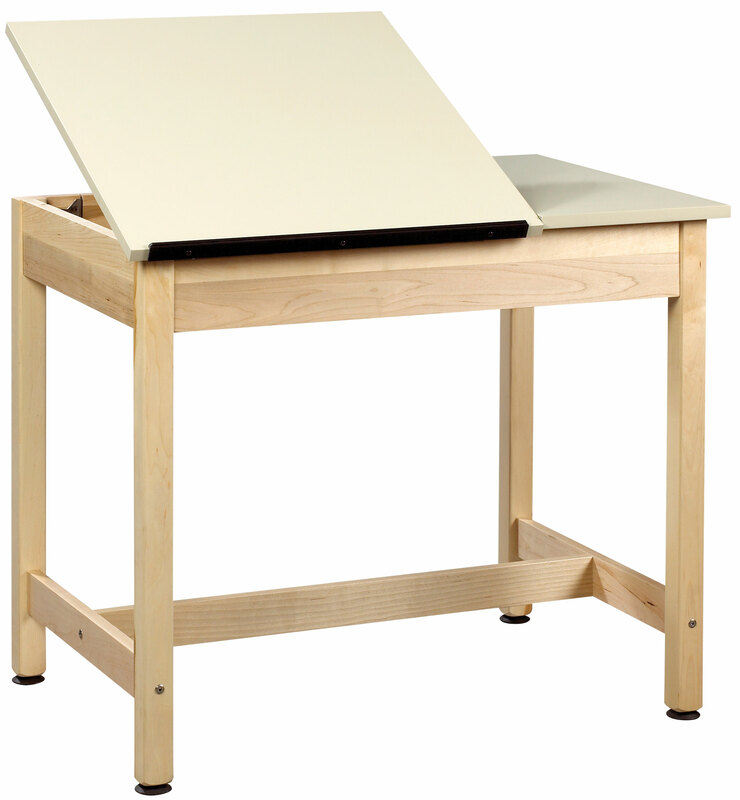 White Melamine board is adjustable to 45 degrees. Available with or without tool and reference drawers. Tool drawer is 8" wide x 23" deep x 3 1/2" high. Reference drawer is 31" wide x 23" deep x 1 1/2" high. A smaller version but the same superior strength as the full size designmaster. 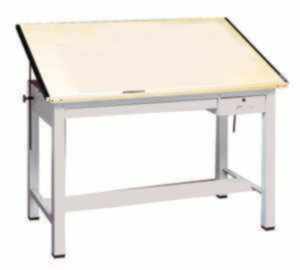 Table top board is smooth, durable, white matte Melamine 36" x 48". 37" Table height. Reference drawer is 23" deep x 31" wide x 1 1/2" high. 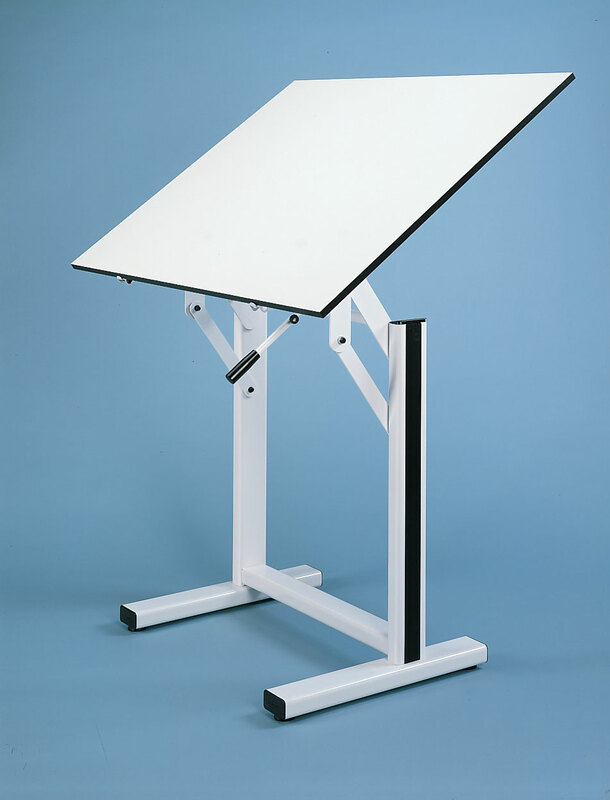 Height is 29 1/2" for convenient access from your work station or desk. 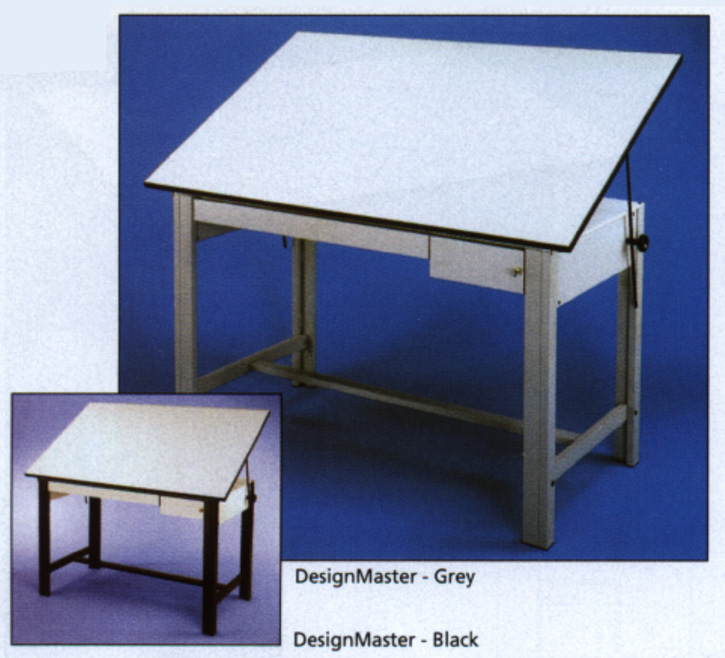 Same features and table top as the Designmaster Compact version without a drawer. 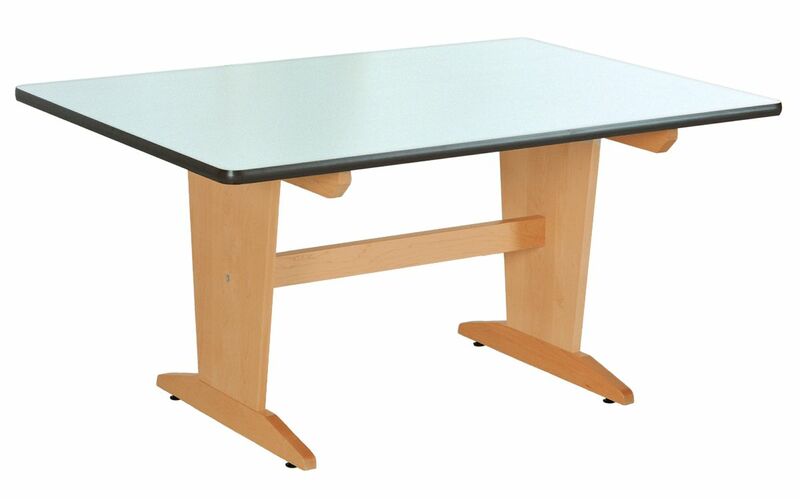 A multi-purpose table with an adjustable angle worksurface constructed of durable wood with a natural finish. 33 1/2" fixed height with floor levellers for stability. One hand ratcheted tilt mechanism adjusts board angle from 0 to 25 degrees. Drawer dimensions 18" x 27" x 1 1/2" inside. Worksurface size 48" wide x 36" deep. 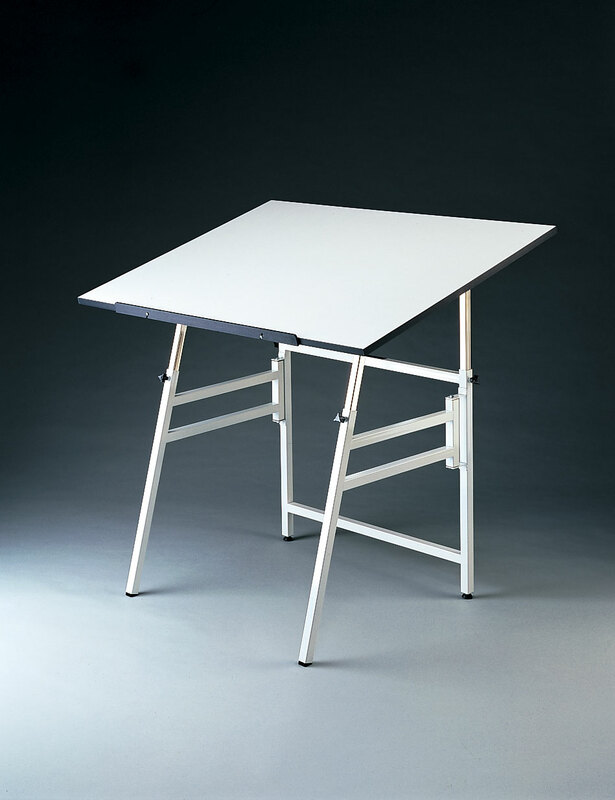 A 4-post table that adjusts easily, from front or rear for a comfortable work angle. 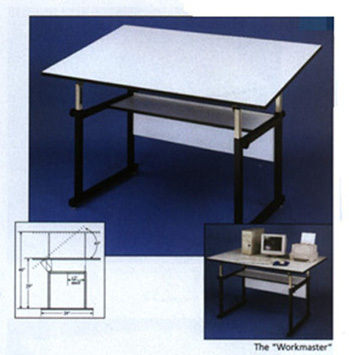 Versatile and attractive, the Workmaster can be used as a reference table, computer workstation or drafting table. 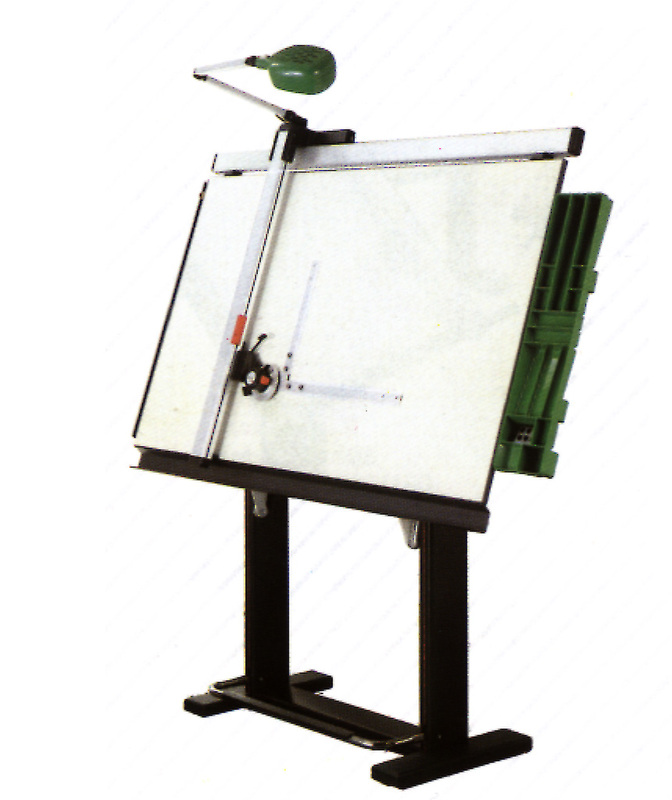 Counter-balance not required when using drafting machine. Ideal for architects. Board angle adjusts from horizontal to 40 degrees. Height adjusts from 29" to 46". Frame is constructed from 1 1/2" heavy gauge square steel tubing. Underboard storage shelf 12" x 42". Choice of black or white enamel finish. A durable 4-post table that is versatile and sturdy with built-in strength for for hard long term use. The angle of the work surface can be adjusted easily from either front or rear. Sturdy base constructed of 1" x 1" heavy gauge steel tubing. 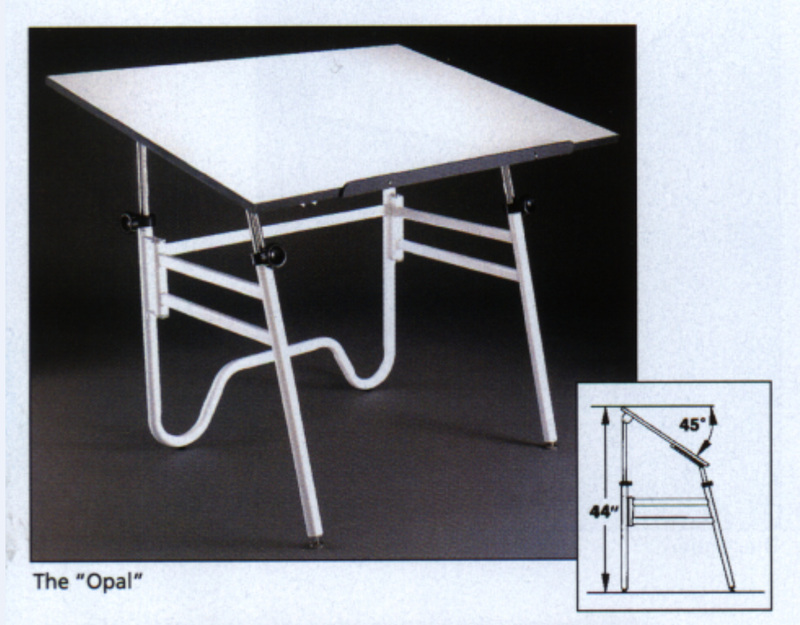 Can be used as a spacious reference table. Ideal for mechanical drafting and architecture. A good classroom table. Board angle adjusts from horizontal to 35 degrees. Height adjusts from 29" to 44". Square corner white top Melamine board. Fitted with 12" x 32" storage shelf. Available in black or white. that is versatile and sturdy. The board angle can be adjusted easily at 1" increments. 24" x 36" top with rounded corners. Height of top when horizontal adjusts from 27" to 40". Includes 23" long pencil ledge. Casters and floor glides included. 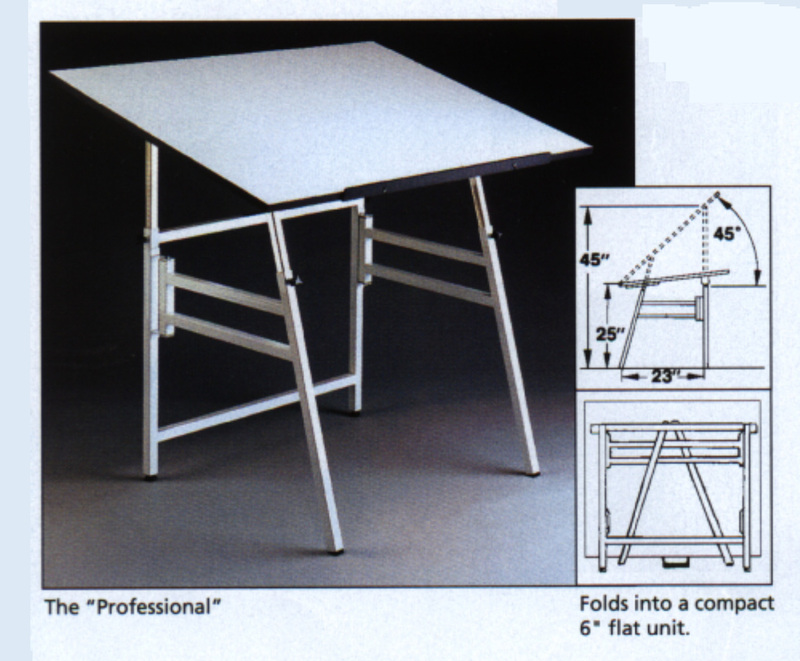 A larger easier to adjust model of the Minimaster 4-leg table. The board angle can be adjusted easily at 1" increments. 24" x 40" top with rounded corners. One-hand ratcheted board angle adjustment. Height of top when horizontal adjusts from 29" to 41"
Casters and floor glides included. Five-year limited warranty. selected cedar base with a smooth natural finish. adjusts from horizontal to 80 degrees. solid core wood grain with vinyl bonded edge. Brass hardware, 24" adjustable pencil ledge. table is perfect for home office and dormitory. Heavy gauge 1 1/2" diameter round steel tubular frame. and tilts from zero to 45 degrees. White or black enamel bases. tubular steel design offers superior strength and stability. 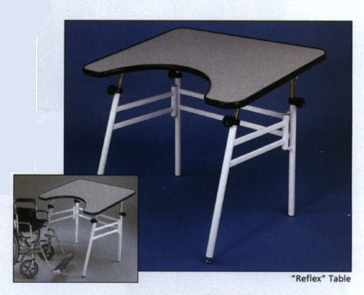 The table caddy can be installed either on the left or right side. Consists of Onyx Drawing Table, Studio Drafting Chair, Swing Arm Lamp, and Black Table Caddy. and round tubular base design for stability. 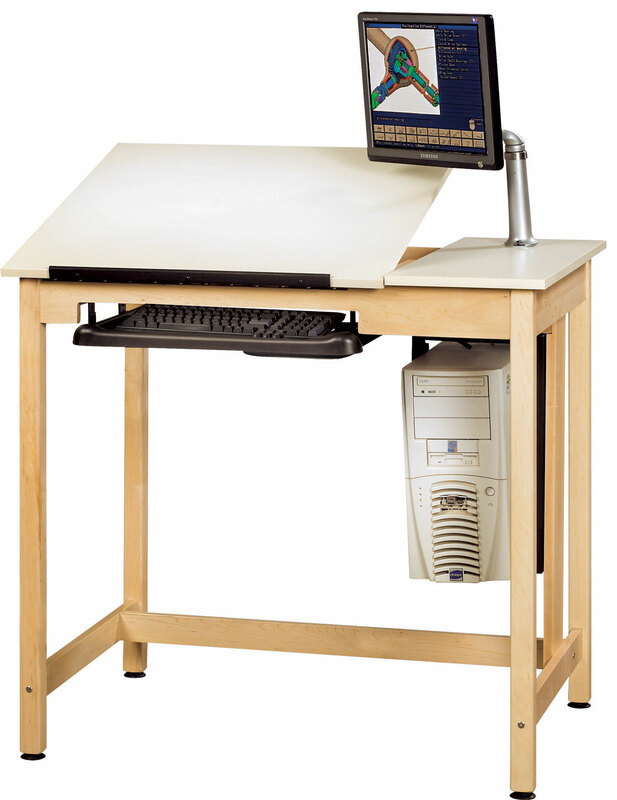 Perfect for graphic artists or students on the go. 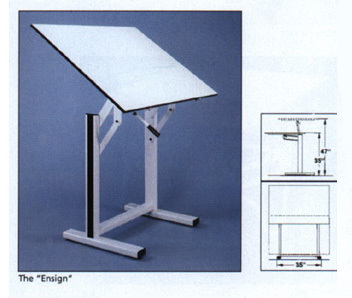 Board angle adjusts from horizontal to 45 degrees, with an adjustable height of 29" to 44". Distance between legs is 28 3/4". White Melamine board. Portable, versatile, space saving and durable. Folds to 4" wide. 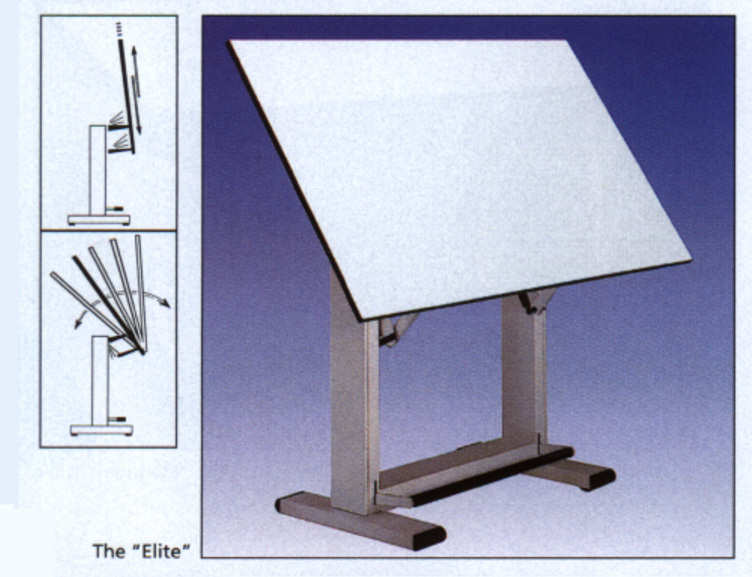 Board angle adjusts from horizontal to 45 degrees, with an adjustable height of 29" to 45". White Melamine board. Choice of black or white enamel finish base. to prevent items falling off the table. and angles from horizontal to 45 degrees. Folds flat for storage. Ideal for invalids. A very rugged table constructed of the finest quality solid oak finished with multiple coats of furniture grade lacquer. Through-bolt construction provides rugged durability. The thermally fused melamine table tops are a wonderful drawing surface. Infinite board angle adjustment. Table height 37". Choice of one piece top or split top. ONE-PIECE TOP Fitted with locking tool drawer and oak pencil ledge. SPLIT TOP Fitted with locking tool drawer. 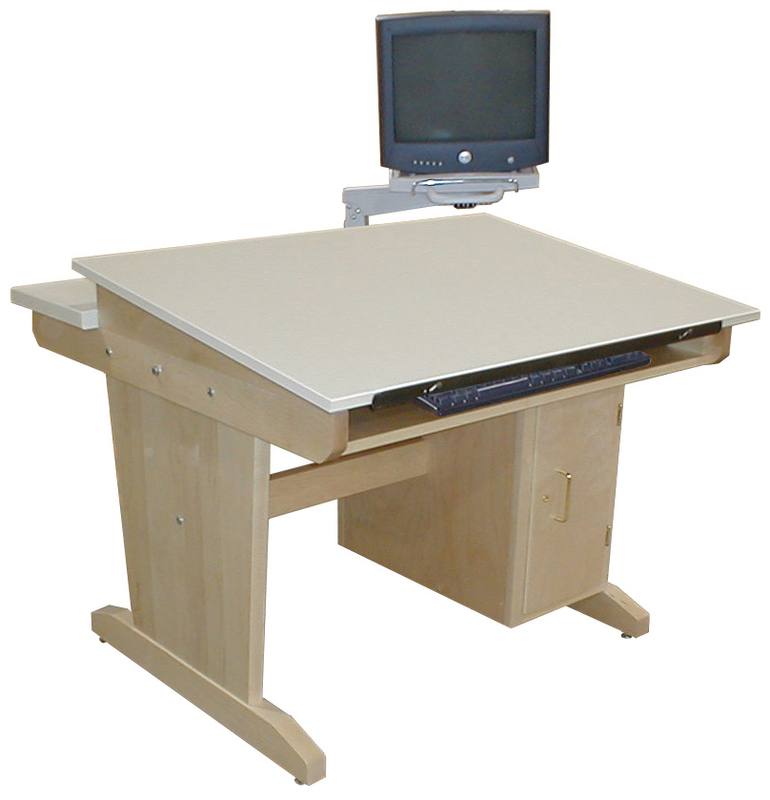 COMPUTER TOP Fitted with adjustable monitor arm and pull-out keyboard tray. No drawers. 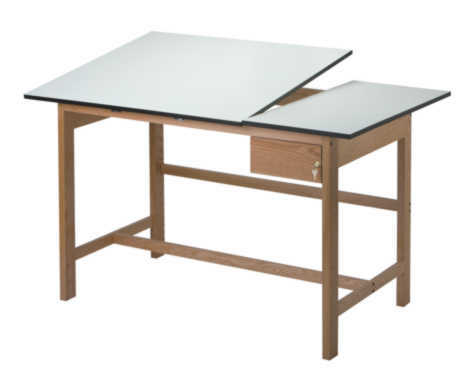 SMITH SYSTEM CLASSROOM ART TABLES Melamine work surface consists of a 7/8" thick high-pressure laminate bonded to a 45-lb. density particle board core with a backer sheet and 3mm flat edges around the perimeter. Split-top design features a 12" wide fixed, flat surface on the right with an adjustable surface on the left. 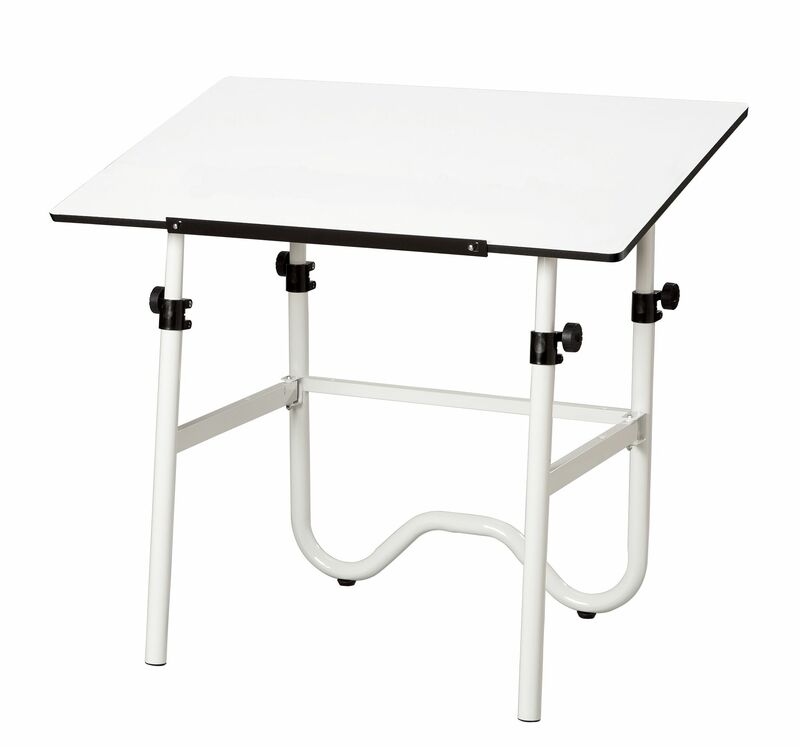 Tabletop adjusts from 0-45 degrees, while table height is adjustable from 29" to 39". Two color combinations are available: maple top with champagne frame, or grey top with black frame. Please specify choice when ordering. DRAWING TABLES All tables have solid 2 1/4" maple legs and aprons. Fully adjustable 3/4" almond colored plastic laminate tops soft close feature. 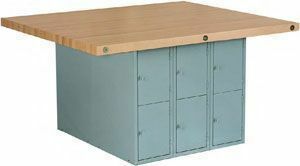 One-piece tops measure 36"wide x 24"deep, while two-piece tops have a 24" x 24" adjustable top with a 12"wide x 24"deep fixed top. Finished with an earth friendly UV finish. 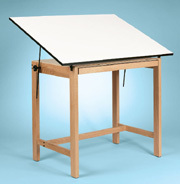 DRAWING TABLES Constructed of solid maple framing and reinforced with 13 gauge steel corner braces. 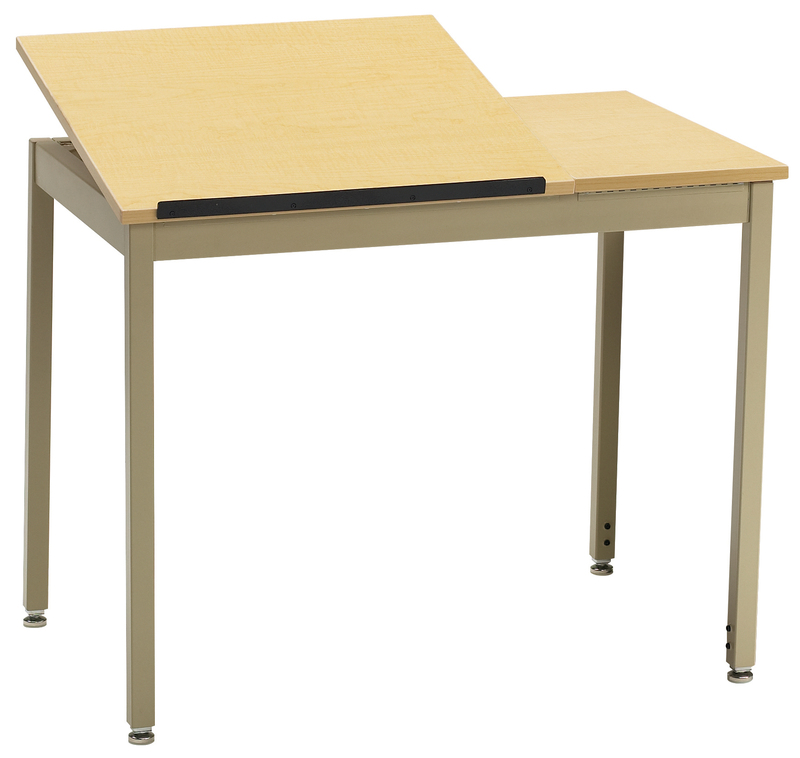 Two-piece split top made of 3/4" almond colored plastic laminate,and equipped with soft-close feature and a pencil stop. 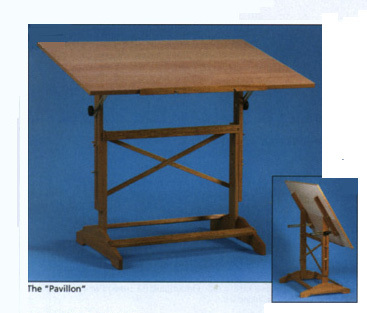 The table top is split into a 30"wide x 30"deep adjustable side and a 12"wide x 30"deep flat side. 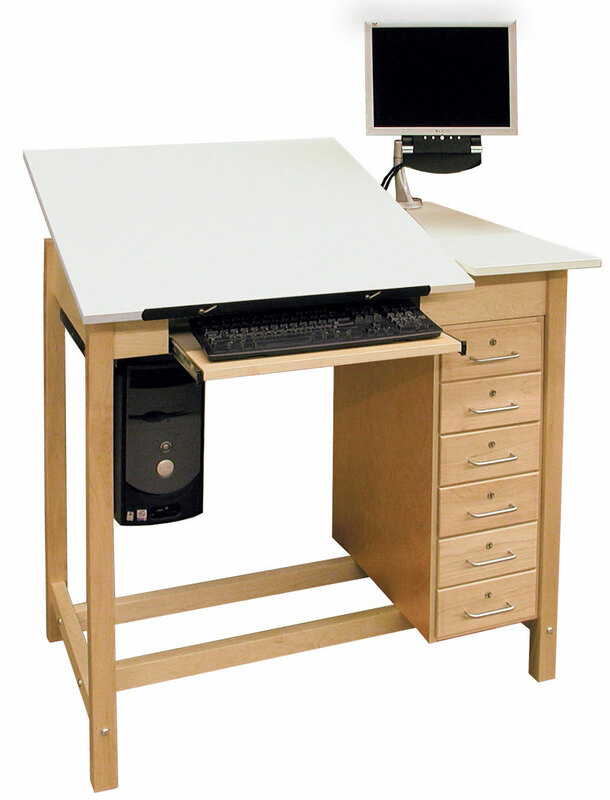 Also includes a CPU storage compartment, a monitor arm, keyboard tray, mouse tray and cable manager. Plastic laminate top 1 1/4"
PEDESTAL TABLES Tapered solid maple pedestal-style panel legs and two solid maple truss bars utilizing bolt reinforcement with CNC joint construction. 60" x 42" x 30" high. Laminate top, 1 1/4" almond or woodgrain. STEEL WORKBENCHES Grey base consists of a double-faced, heavy-gauge steel unit, welded and riveted throughout. The unit provides 12 locker openings which measure 12"w x 21"d x 15"high. Vented doors have spring-loaded hinges, padlock hasp and knockout plug for cylinder locks. Top is constructed of 2 1/4" maple. Overall size 64" x 54" x 33 1/4" high. 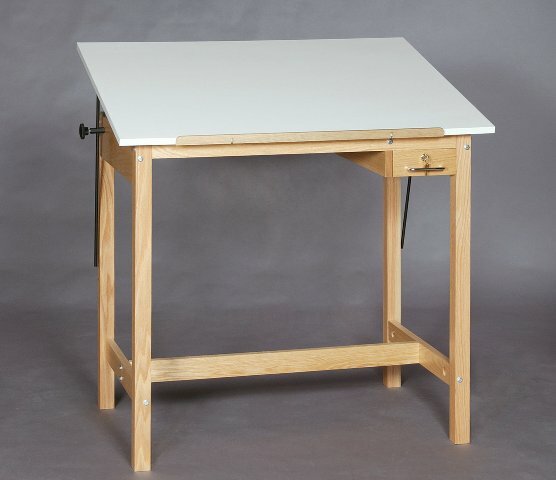 CAD/DRAFTING TABLES Combination CAD/drafting table constructed of solid northern hard maple. The 30" x 30" x 3/4" Fibresin work surface quickly and easily tilts, with a fixed 12" x 30" flat reference surface. Pullout keyboard tray, adjustable monitor arm, open design hanging steel CPU holder and wire management. 42"wide x 30"deep x 39"high (at front edge). Available with or without 6-drawer, locking storage unit. 42"w x 401/2"d x 33"high at front edge. 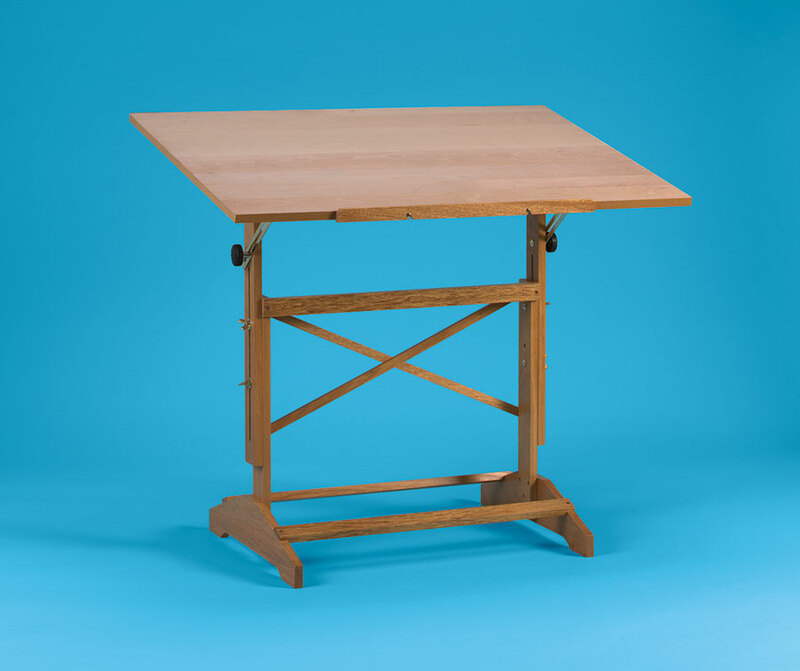 MULTIPURPOSE ART TABLES Multi-purpose art tables are constructed of solid maple with bolt reinforced mortise and tenon joints for strength and maintainability. 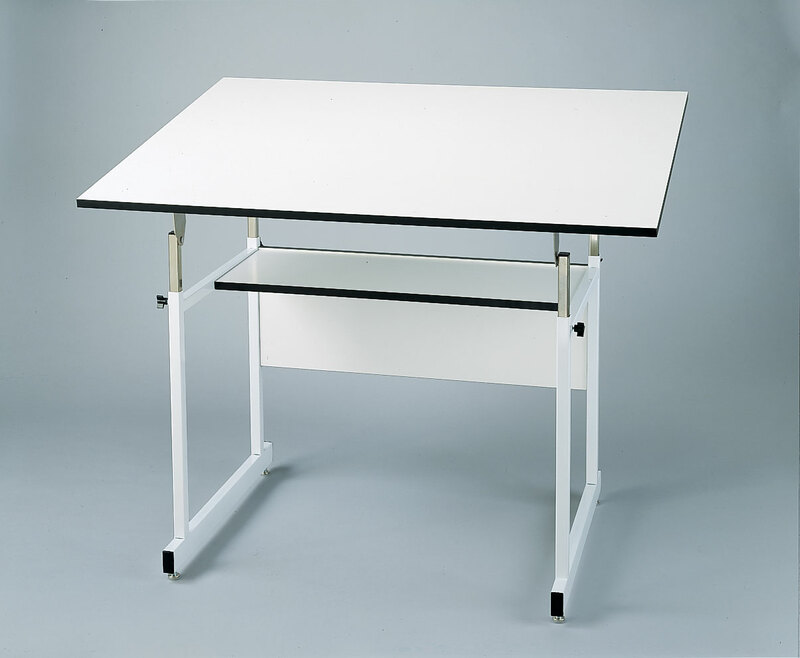 Heavy base components and wide feet fitted withadjustable floor guides for stability. 42" x 60" work surface. Choice of 1" Maple or 1 3/4" Laminate top.